I mentioned that this year I have kindly been asked to take part in the #TeamHonk blogger relay for Sport Relief 2014. Whoop! It’s been great fun so far, even the training rides on cold mornings where my fingers and toes have turned numb within 15 minutes of heading out. And that’s even with my thickest woollen gloves and neoprene overshoes – has anyone any tips on how I can conquer this by the way? Please!? It hurts! So we’re going from Grantham to Nottingham dressed as Robin Hood and his Merry Men. Yes, women cycling as Robin Hood. It’s going to be great. And yes I realise I’m saying that now, before we’ve actually made it down the soggy canal paths and ice filled puddles and arrived home with mud splattered faces. What’s a bit of mud between friends anyway. I know I’ll still say it afterwards – after all, we’re going to be raising money for a fantastic cause. 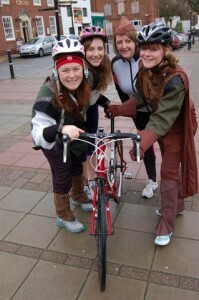 Women cycling dressed as Robin Hood? Well, what else would you expect for Sport Relief 2014 and Nottingham’s leg of the #TeamHonk blogger relay?! 50km really is the furthest I will ever have cycled and that goes for the fabulous women in the picture above too, so it’s going to be a challenge. Please realise that cold winter cycling really isn’t my thing. But this year is going to be different. It really is a year of new beginnings and new challenges, and by sponsoring us you can really help to make a difference in the life of someone who needs that extra bit of support. Support that Sport Relief is so brilliant at providing. Even a fiver can make a huge difference. Incredibly, just £5 could pay for a mosquito net to protect a mother and her baby in Africa from contracting malaria while they sleep, so if you can, please sponsor us. It’s not too late to get involved in Sport Relief 2014. There are official events taking place all around the UK and there is bound to be something just right for you, including a 50 mile bike ride. Share the post "Sport Relief 2014: Robin Hood, Robin Hood and his Merry (Wo)men!" « Ordinary Cycling Girl doing the London to Paris cycle ride – Eeek!! 2 Comments on Sport Relief 2014: Robin Hood, Robin Hood and his Merry (Wo)men! Just catching up with all the team honk happenings! It’s so great we have all come together to raise money. It’s been epic! I still can’t believe that you seriously cycled 50km, you ladies rock!